Kaley Cuoco was on hand as a nominee this evening(January 29th) for the 23rd Annual Screen Actors Guild Awards at the Shrine Auditorium in LA. 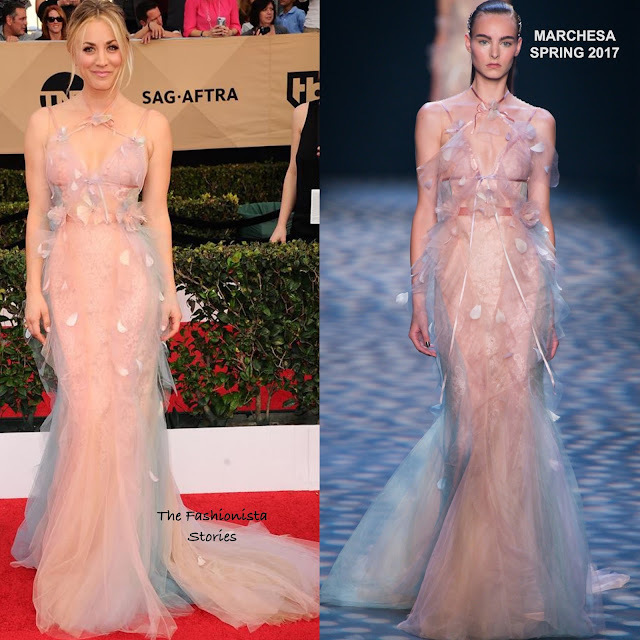 The 'Big Bang Theory' star wore a MARCHESA SPRING 2017 pink & light blue lace tulle layered gown which featured multi-straps petals and a train detail. I like the gown, I am just not sold on the color for her. She is wearing a light pink shade but maybe a shade closer to the model's could have offered up some balance. She looked pretty nonetheless. LE VIAN jewelry and a up-do completed her look. Does the color work for you on Kaley? She makes it work better than the model. Best she's looked in ages!